NEW BRUNSWICK, NJ – Abundant Life Family Worship Church is using a Broadcast Pix Slate 5000 video production system for its multi-camera video production and I-Mag. Every service at the church is recorded, and one sermon from each week is televised locally on a public access cable station. Abundant Life also streams its services live, and many sermons are available on demand at www.streamingfaith.com. 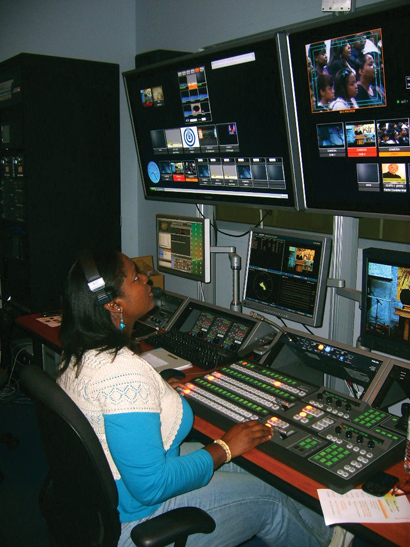 The Abundant Life control room is located near the entrance of the church and can accommodate a six-person production team. With volunteer crews, however, audio and video responsibilities are often handled by a much smaller crew. Dickenson Jean-Louis, sound technician and media director, credited the built-in functionality of the Slate system. "It can be a one-man show if we don't have enough people," he said. "We love the switcher." During productions, Abundant Life relies on Slate's workflow tools, including the built-in Inscriber CG that is used to produce lower-thirds to identify Bishop George C. Searight and special guests. With Fluent Multi-View, the church was able to replace a collection of small CRT monitors with one LCD screen. Plus, Jean-Louis said playing video clips used to be complicated, but Fluent Clip Store has simplified the process. "Now it's just seamless," he said. "There's no problem bringing in video. It's so convenient." Entertainment Professionals Collective, LLC, Somerset, N.J., served as the dealer and integrator for the project. While Abundant Life is still producing its video projects in SD, Jean-Louis said the plan is to upgrade to HD – and continue to use the Slate 5000 – when the congregation moves into its new facility, which is currently under construction.